Rescued July 2, 2012 The lady rubbed her eyes in disbelief at the poor starved creature that had been dumped in an abandoned field near her stable. His head hung down to the ground as he listlessly shuffled about his body covered in flies. She sprang into action bringing the poor horses fresh water then moved it to her barn where she gave it senior feed, hay and water then contacted Joan Benson at the Horse Protection Society. Of course, we would take the horse but she would need to get him to us. The lady had never trailered a horse but she summoned all her courage and drove the horse down from Chatham County to Rowan County in rush hour traffic. Often when we most need strength, it comes to us from an unknown place deep wilthin. 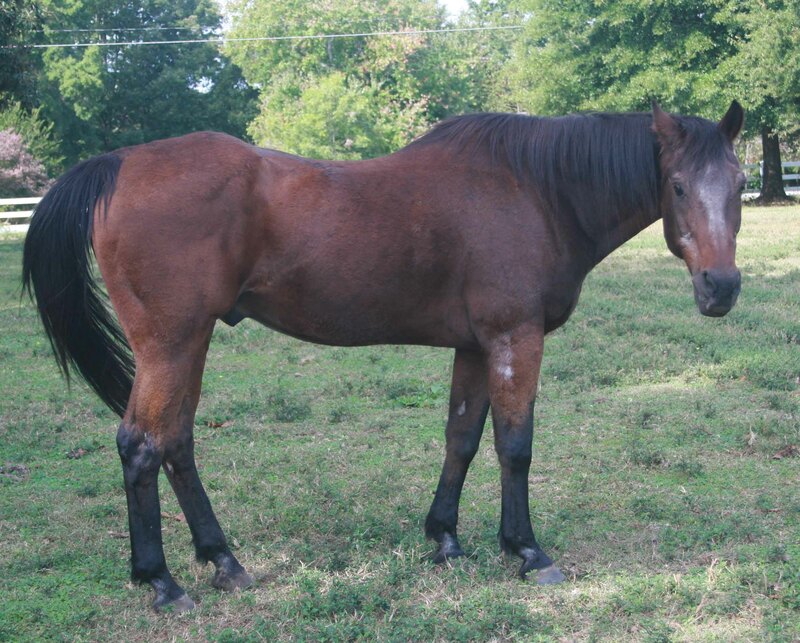 Cree arrived safely to the sanctuary July 2, 2012. We sheltered the horse in a medical stall for the first week while keeping close watch on the gelding for re-feeding syndrome, a condition in which the body begins to shut down when it receives too much nourishment after a long deprivation period. We began a detox system to and put him on all the hay he could eat along with a little alfalfa. If a horse is to succom to re-feeding syndrom it will usually happen within the first 3 days of refeeding. That is why we always feed plenty of hay the first night then slowly increase the feed by a 1lb a day until the horse is on full rations. We have never lost a horse to re-feeding syndrome using this process. We have named this lovely bay gelding with the big brown eyes Cree. He is probably 30 years old so it may be more difficult to put weight on him than on a younger horse but unless there are any extentuating conditions he should return to full health by the end of the year. 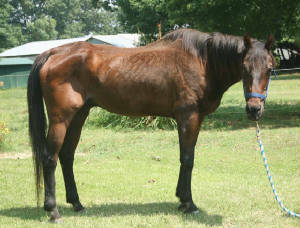 If you would like to help Cree, please become his Angel Sponsor. He will be needing dental care in addition to vaccinations, hoof care, feed and hay.